Tony Parker is the head of the dragon. His ability to penetrate, find the open man, and finish at the rim in traffic have been central to the Spurs system over the years. And while Tony may not always get the assist, or even the hockey assist, he makes San Antonio greater than the sum of its parts every time he is on the court. His spot on the All-NBA Second Team this season is well deserved. 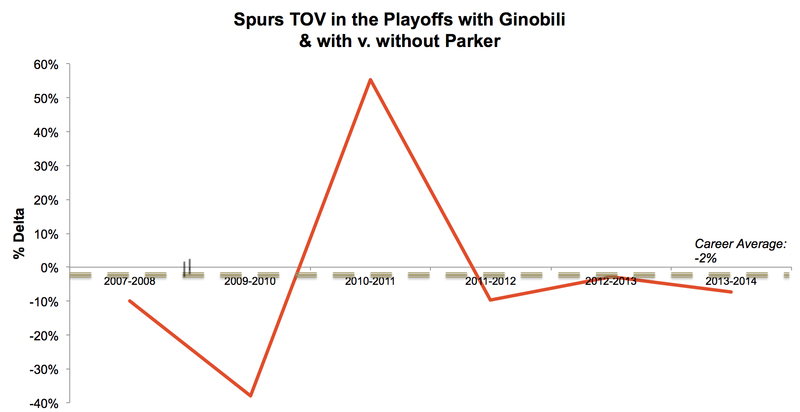 By looking at standard box score stats throughout his career, the value that Parker adds to the Spurs can get lost in all the noise. So instead, I decided to slice and dice NBA lineup data beginning with the 2007-2008 playoffs. With the exception of the 2010-2011 playoffs that I would like to block out my memory forever, Tony’s presence on the court really provides a great lift to the Spurs in the paint. 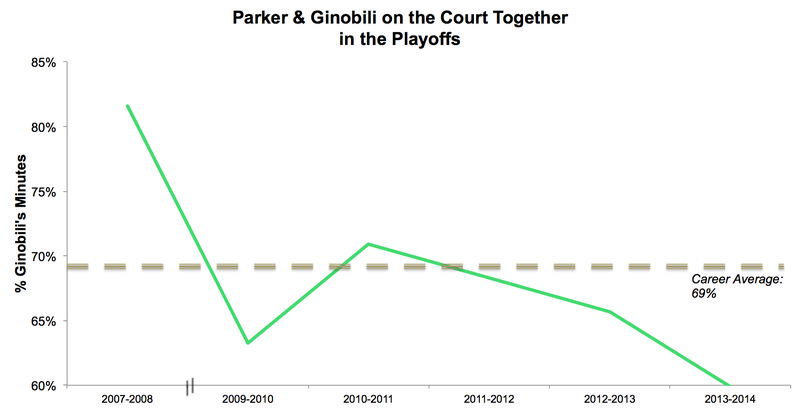 (Please note that the big blip during the 2008-2009 postseason is largely because Manu Ginobili, the sixth man of our hearts, was injured.) After a few low seasons, Parker is back to being above his career average of providing a 14% lift to his squad when it comes to PITP when he is on the court. I would like to highlight that, though 57% of Tony Parker’s field goal attempts have been in the paint this season, his impact does not just come from scoring. He also sets the tone for the Spurs’ younger rising stars, who continue to attack on offense while Parker is on the bench. During this year’s playoffs, the Spurs are averaging 49.1 points in the paint for every 100 possessions that Tony Parker is on the court. Interestingly, they still score an impressive 41.8 points in the paint with him off the court. For context, the Miami Heat, as a team, is averaging 38.1 PITP during the current 2013-2014 postseason! 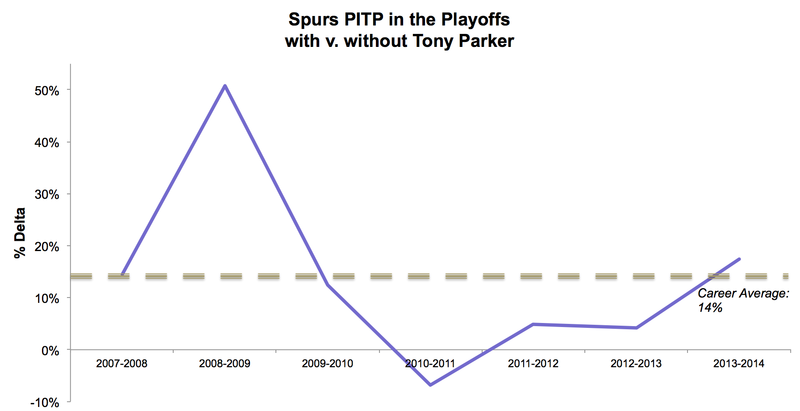 I will note that, since the 2007-2008 playoffs, 86% of the time Tony has been on the court, Timmy has also been out there. As a result, not all of the credit should necessarily be given to Tony, but he is undoubtedly a large part of the Spurs’ success in the paint. And don’t worry-Tim Duncan will get his own analysis soon. My main motivation for sharing the graph above is that I want us to appreciate the playoff career average delta of 4% that Tony Parker’s presence on the court provides the Spurs. That is remarkable! As Buford, Pop, and Holt have assembled a world-class supporting cast to help the aging Big 3, the delta has reduced over time. However, this is not a bad thing. The emergence of Kawhi Leonard, Danny Green, and Patty Mills definitely has something to do with it. When Tony Parker is on the court, he is the primary playmaker. 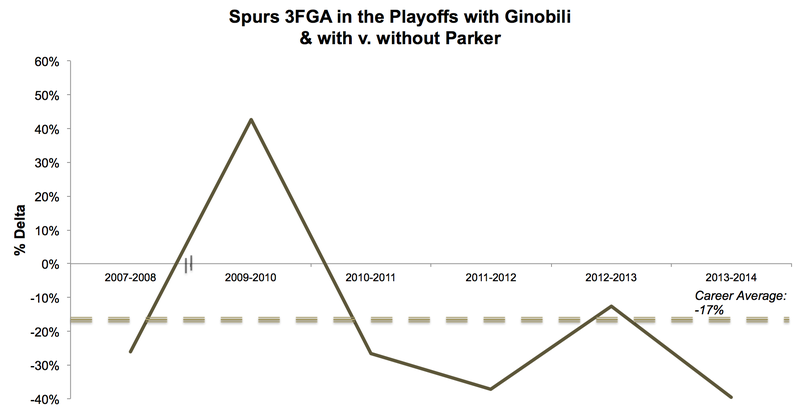 Meanwhile, for Manu Ginobili’s less-experienced second unit, he is at the helm more often. Though, as we saw during Game 6 of the Western Conference Finals, Manu Ginobili can play point when the team needs him to, his natural position is shooting guard. 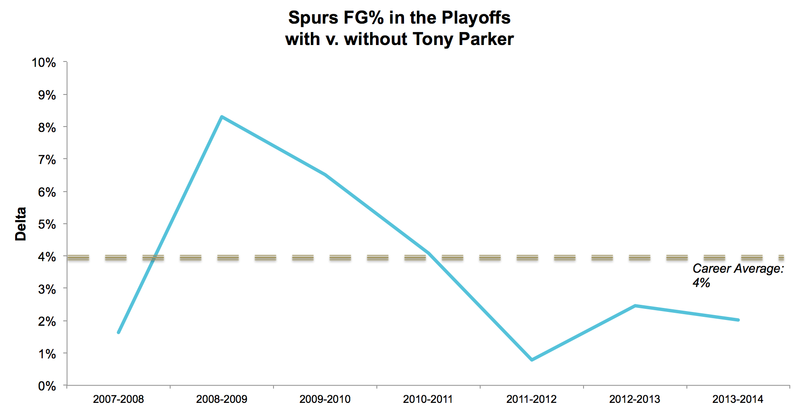 For their postseason careers together since 2008, Tony’s presence on the court has curbed the number of three pointers that the Spurs have taken by 17%. It has been even more pronounced this season, with a whopping -40% delta. In past seasons, many of the long range shots that a Parker-led team has avoided were ill-advised. In this year’s playoffs, the crafty lineups that Pop has engineered have definitely played a role in the shot selection figures. This is especially true when Manu Ginobili finds himself on the court with Danny Green, Patty Mills, or Marco Belinelli. However, there is no doubt that Tony Parker is the commander on the court. Through the years, we have all witnessed a young nineteen-year old boy from France withstand a trial by fire from Pop, years of silence from Duncan, and infamous off the court drama to blossom into arguably the best point guard in the league. Ever since the Spurs’ last successful title run in 2007, this has been Tony’s team. Based on the numbers and really just watching Spurs basketball, he does not take this responsibility lightly. Though the Spurs are ushering in a new era of talent in the hands (pun intended) of Kawhi Leonard, this is still Tony Parker’s team. (And, by the transitive property, it is still Tim Duncan’s team.) I know that the Spurs were able to close out the Thunder without Parker, but don’t fool yourself into thinking that the best bench in the league can cover for him against the Heat. Get better soon, Tony! We are counting on you to be at full throttle.